Vast Public Indifference: Should President Obama Honor Confederate Soldiers? Should President Obama Honor Confederate Soldiers? Apparently, several historians have written a letter to President Obama asking him to discontinue the nearly century-old tradition of placing a wreath at the Confederate Memorial at Arlington on Memorial Day. Over at Civil War Memory, Kevin Levin argues that the letter strikes the wrong tone and should be ignored. I would be perfectly happy to see Obama's staff "forget" to order the wreath for this particular bit of Lost Cause nostalgia, but that's not really his style. 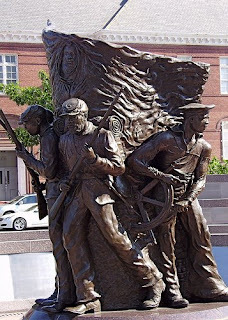 It seems much more likely that President Obama could be persuaded to add an extra stop on that Memorial Day wreath-laying tour — I suggest a trip to the African American Civil War Memorial before the Arlington excursion. Anyone can start a tradition. If Obama lays a wreath for secessionists, which I assume he will, let him also lay one for the freemen who fought for Union and liberty. Hopefully, his successors will continue to do so for the next century.